European Journal of Tourism and Trade and Trade has an average readership for issue of more than 120.000 professional’s that includes the 180 embassies in Europe as well as all major European government institutions, private corporations and the international community at large. As the flagship newspaper of the European tourism community, we are the only publication in the Europe able to reach the tourism highly targeted and lucrative market. The 15th issue of European Journal of Tourism and Trade was published. European Journal of Tourism and Trade 2017 has an average readership for issue of more than 150.000 professional’s that includes the 280 embassies across diverse European cuntries as well as all major European government institutions, private corporations and the international community at large. ​ As the flagship newspaper of the European tourism community, we are the only publication in the Europe able to reach the tourism highly targeted and lucrative market. European Tourism leader, President Anton Caragea marked the main terms of cooperation with the Kingdom of Cambodia and outlined tyhe main points of a three years plans (2017-2020) in fostering the toruism and cultural international presence of Cambodia in the world. The target of the three year plan of cooperation with ECTT is to bring to life the forecasts for 2020, international tourist arrivals that is expected to rise to about 7 million people and to bring the total revenue of approximately US $ 5,000 million, creating job opportunities for nearly 1 million people. President Professor Dr. Anton Caragea outlined his support in fostering cooperation in the fileds of tourism training, hospitality staff development, creating a Tourism Institute of Cambodia and supporting law reform and unpdating in the fields of tourism investment promotion and tourism education and natural conservation. Concluding the official tourism delegations meeting, Europe`s President Professor Dr. Anton Caragea had a photo taken with the participants and gave an interview with Cambodian National Television. The dialogue was held in an amicable atmosphere and was based on an throughly assessment of the regional evolutions in Indochina and Europe and was built upon the common objective of building a development agenda, focused on the fulfillment of Sustainable Development Goals as voted in December 2015 by the United Nations. Cambodia is today an example for this area of the world in economic growth and the Government led by Academician Dr. HUN SEN is an example of development and national efficiency. All reaching dialogue, lofty discussion between Samdech Akka Moha Sena Padei Techo Dr. HUN SEN, Prime Minister of Cambodia and President Professor Dr. Anton Caragea MA, FINS, ETA. The succesful governance of our country was based on the trust build between his team and the people of Cambodia and validated in the course of the years, by the electoral voting process, concluded Academician Dr. HUN SEN. The 12th edition of the European Journal of Tourism and Trade is dedicated to the new main world tourism destination: THE REPUBLIC OF ZIMBABWE-WORLD BEST TOURIST DESTINATION for 2014. Zimbabwe, the first African country to be elected as World Best Tourism Destination was after a thoroughly selection process unanimously elected by more than 200 European tourism specialists as WORLD BEST TOURIST DESTINATION in 2014 based on his extraordinary natural beauties together with its fabulous historic and archeological potential and for his outstanding track record for safety of tourism and for ethical and green tourism. Zimbabwe is offering to world tourists the fabulous historical patrimony of the famous kingdom of Great Zimbabwe-Masvingo and is also offering the opportunities such as the visit to Kariba Lake, discovering African rock paintings, Eastern Highlands, Exfoliated Hills and wonderful safari , everything is creating in Zimbabwe the favorable spot for cultural and environmental oriented travel experience. The latest issue of European Journal of Tourism is presenting in full the debates hold on the award, the list of competing countries and the long list of reasons for awarding WORLD BEST TOURIST DESTINATION AWARD IN 2014 to THE REPUBLIC OF ZIMBABWE. Other high-profile articles are dedicated to: the extravaganza and the ceremonies held in Harare for WORLD BEST TOURIST DESTINATION AWARD-2014, the full length speech of President of Zimbabwe-world leader of tourism-Robert Gabriel Mugabe and the election as a new member of European Tourism Academy of Minister of Tourism and Hospitality Industry of Zimbabwe, Eng. Walter Mzembi. Special highlights of the special number of European Journal of Tourism are also: the visit of the European Council on Tourism and Trade delegation in Zimbabwe and the agreements reached on fostering touristic and diplomatic relations between Europe and Zimbabwe. Four pages are dedicated to photo chronic`s to showcase the luxurious ceremonies for WORLD BEST TOURIST DESTINATION IN 2014 held in Harare-Zimbabwe. 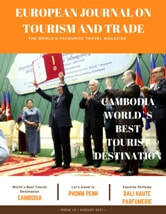 The 8th edition of the European Journal of Tourism and Trade is dedicated to LAOS-WORLD BEST TOURIST DESTINATION for 2013.